ON THE same day Michael Schwerner, James Chaney and Andrew Goodman were posthumously awarded the Presidential Medal of Freedom, the nation for which that medal stands took a giant lurch backward, into the era of feverishly fabricated, desperately rationalized darkness that made their sacrifice what it is today. 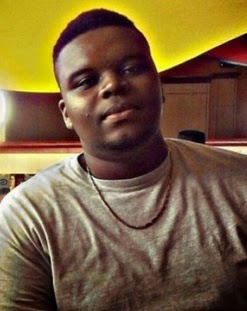 Darren Wilson, a white police officer for the city of Ferguson, Mo., was cleared late Monday of any and all charges for the August 9 killing of Michael Brown, Jr., by a grand jury manipulated by a prosecutor’s personal and political mission, and a governor’s own invertebrate inclinations. 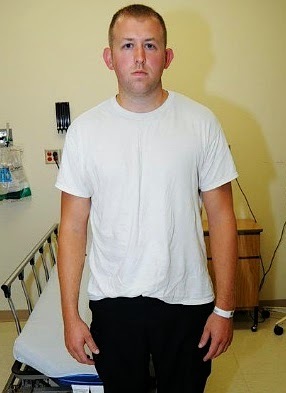 Despite numerous eyewitness reports that suggest Wilson’s actions may well have been a murder in everything but name, the Ferguson cop walked on charges of first and second-degree murder, voluntary and involuntary manslaughter. Wilson now joins George Zimmerman, the slayer of Trayvon Martin, in that dim outback pariah zone of the American consciousness, a space inhabited by our national cyphers and trivia-question answers, people of rash action and weak judgment. We knew something heavy was coming when the drum roll started. 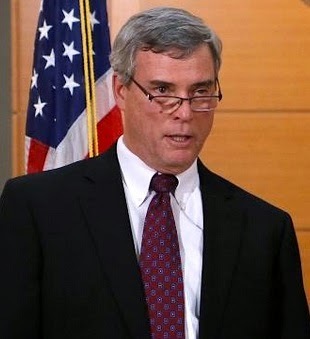 Seven or eight minutes before St. Louis County Prosecutor Robert McCulloch went into a room at the Buzz Westfall Justice Center in Clayton, the county seat and 11 miles south of Ferguson, someone in the crowd outside — somebody with a nice sense of drama and American military tradition — began a prolonged drum roll, the kind before a ceremony, or an execution, maybe, in the era of the Civil War. It may well have been a flourish before the summary execution of proper prosecutorial conduct. McCulloch launched into a bizarre 25-minute disquisition by turns rationalization and incident report, praisesong for the grand jurors and indictment of the media. Some of the problem with McCulloch’s soliloquy wasn’t what he said, it was the way he said it. Mostly with his head down, buried in his prepared statement, McCulloch might as well have been reading from an actuarial table or documenting the fine points of an insurance policy. He made the obligatory acknowledgement to the Brown family of the pain and heartache of their son’s death, but it was pro forma. There was very little heart behind it. NOT NEAR as much heart as he put into his shots at the media. “The most significant challenge encountered in this investigation has been the 24-hour news cycle and its insatiable appetite for something, for anything to talk about, following closely behind with the non-stop rumors on social media,” McCulloch said, completely overlooking his role in giving the media, and everyone else, exactly that — in a number of targeted leaks of information intended to smear Michael Brown’s character and reputation. From the beginning, McCulloch embarked on a strategy breathtaking for its manipulation of legal practice. McCulloch, with a generosity uncommon to prosecutors, decided to give the grand jurors all the available evidence in the Michael Brown case — to effectively flood the zone with evidence, both that consistent with what a prosecutor requires, and information commonly used at trial by a defense attorney. A number of exhibits — Brown’s toxicology workup, an unrelated video of Brown minutes before the fatal encounter with Wilson — were introduced by McCulloch’s staff, in what amounted to character assassination by way of an unusually generous prosecutorial largesse.. The county prosecutor was doing the work of a defense attorney. Wilson’s defense attorney. 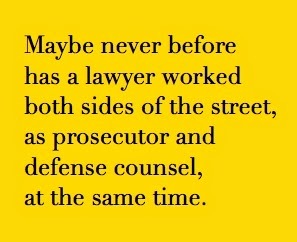 Maybe at no other time in the history of American jurisprudence has a lawyer worked both sides of the street, as prosecutor and defense counsel, at the same time. Some of what McCulloch said Monday night (much of it already on the record), left open challenges by the Justice Department, which we can almost certainly expect as the closing statement of Eric Holder’s career as U.S. attorney general. Considering the low threshold for an indictment on a charge of voluntary manslaughter — probably the one and only charge Wilson was really facing — the question is, how could a sequence of several shots, followed by a brief pause, followed by another string of several shots not rise to the level of at least voluntary manslaughter? Wilson’s pause in the slaughter — that break for reflection, for thinking — will almost certainly be an issue in any follow-on actions by the Justice Department, which, thanks to groups like CREDO and ColorOfChange, is being pressured to make a top priority in the sunset of Holder’s Justice Department career. THE EVENTS of Monday night throw shadow on the sunset of another political career: President Obama. Presiding over yet another teachable moment in the national history, Obama made an impromptu address to the country from the White House Briefing Room not long after McCulloch’s statement. The president’s speech was perfectly necessary. But in some ways its timing, and television’s use of that timing, were perfectly awful. On MSNBC, and probably other networks, viewers were witness to an arresting real-life coincidence that split-screen technology made the most of. 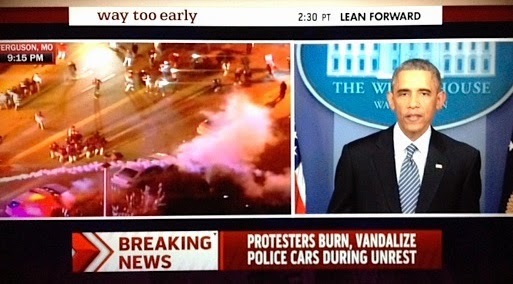 On one side of the screen, Obama spoke with force and clarity about the need for calm in the wake of the Ferguson grand jury proceedings. On the other side of the screen — in a surreal, tragically ironic real-time juxtaposition, were images from the streets of Ferguson: tear gas aloft, police cruisers rocked by protesters, cops advancing. That juxtaposition — not before and after, but now and also-now, distilled everything of the national dynamic about race; it explained, like no words could, the schizoid comfort/discomfort zone we live in as a nation. How on racial issues we’ve gotten comfortable with a perverse balance of the anodyne and the anarchic. The president got this himself, made it clear later in the speech that he understands how that split-screen applies to anywhere in the nation. Twenty-four hours later, you could juxtapose other related events from more than 100 different locations, across the country. And the networks did just that, juxtaposing events in Oakland, Calif. (where protesters lay down on the highway in protest of the grand jury’s decision) and Chicago (where protesters hit the downtown streets in vast numbers). WHAT WENT down on Monday and Tuesday in Seattle (where protesters snarled traffic on the interstate and staged spot demonstrations on Capitol Hill) was much the same as what happened in New York City (where protesters filled Times Square, shut down three city bridges and splashed NYPD Commissioner Bill Bratton with red paint). You could split-screen Los Angeles with Salt Lake City. And Denver with Cleveland. And Milwaukee with Miami. And Albuquerque with Atlanta. And Dallas with Minneapolis. “We need to recognize that this is not just an issue for Ferguson,” Obama said Monday. “This is an issue for America. We have made enormous progress in race relations over the course of the past several decades. I've witnessed that in my own life. 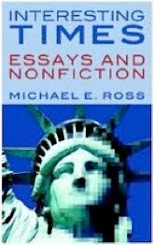 And to deny that progress I think is to deny America’s capacity for change. THE POSTWAR world of the United States is slowly taking shape in Washington. Republicans are flush with victory after Tuesday’s election, the results of which confer unto the GOP the first Republican-dominated Congress in eight years, and the biggest Republican majority in the House of Representatives since Truman. 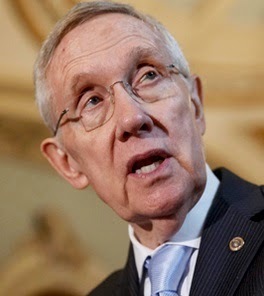 Kentucky Sen. Mitch McConnell, fresh off his own big re-election win, is set to become the new Senate Majority Leader; the drapes are being pulled out of Harry Reid’s old office as we speak. 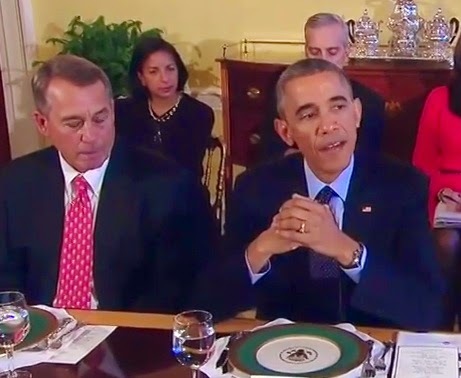 And with the election announcing a new Congress, there was a brief détente of sorts on Capitol Hill early this week. 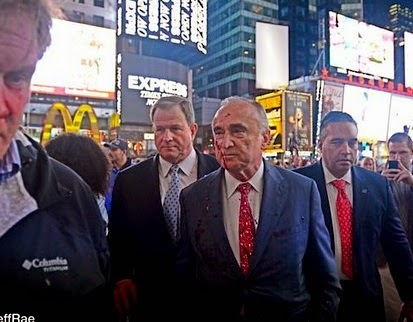 The peace dove was loose in the air. On Wednesday, McConnell said that, under his watch as majority leader, “we’re not gonna be shutting down the government or defaulting on the national debt” — a pre-emptive budgetary olive branch to the Obama administration if there ever was one. President Obama, likewise making nice, spoke the same day in the East Room of the White House, saying “I would enjoy having some Kentucky bourbon with Mitch McConnell.” We can hear the Woodford Reserve splashing into glasses, neat. But before you cue up “Kum Ba Yah,” take note of something else: Wednesday was the same day that McConnell and House Speaker John Boehner published an op-ed for The Wall Street Journal, outlining GOP plans in the new Congress. “I’ve made clear to the president that if he acts unilaterally, on his own, outside his authority, he will poison the well, and there will be no chance for immigration reform moving in this Congress,” Boehner said. We’ve seen congressional-powered gridlock for much of the previous three years. Now we can anticipate a different kind of stasis, as President Obama (backed into an operational corner like never before) uses executive orders to advance his legislative agenda — and vetoes legislation coming from a Congress whose bills he’s rejected, but far more infrequently, before. THE TELEVISION schedules of everyone in America will now return to their regularly scheduled commercial programming. Our long national TV campaign-ad nightmare is over. 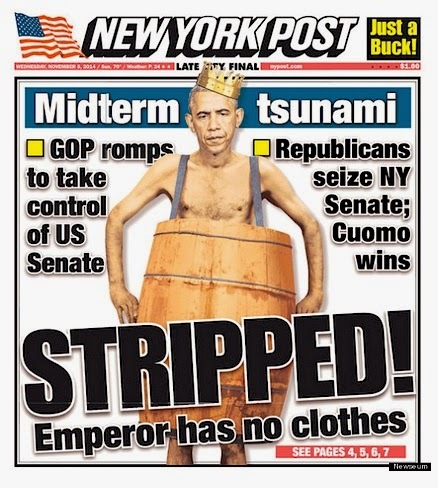 The defeat of the Democrats in their bid to hold on to the United States Senate — the defeat that pundits and analysts have been predicting for weeks — came to pass last night, as voters seriously vented, letting off steam in a number of battleground states and ushering in a unified Republican Congress for the first time in eight years. A number of governor’s races went the Democrats’ way, and 147 ballot initiatives let liberalism ring, with approvals for recreational marijuana and a striking agenda for enhancing the minimum wage. But other governors’ races — Florida, lost by a hair; Wisconsin, lost in a walk — went the Republicans’ way. And the big enchilada, the Senate was gone. When is a wave not a wave? The anti-incumbent outrage that animated a lot of the political media never really materialized. Incumbents Democratic and Republican alike stayed on in states from Maine to Nevada, Iowa to New Jersey. There was a wave, to be sure, one that solidifies control of the Congress by the Republicans. 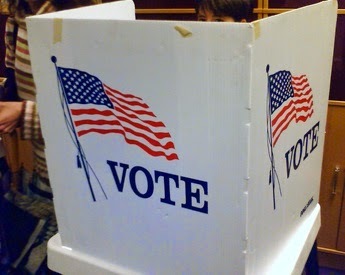 But with several incumbents held over, at the Senate and gubernatorial levels, it was clear that any anti-incumbent wave was a situational experience, not a wave but a wavelet, with voters assessing on a state-by-state basis who was doing well and who wasn’t, an overview that wasn’t subject to being applied across the board. There were exceptions, some breaks in that wave for the Democrats. Progressive ideas advanced in red states, with ballot initiatives in four states approving new minimum wage standards. In Colorado, the regressive “personhood” amendment went down to defeat (for the third time). And in blue-state Oregon and red-state Alaska, voters approved measures decriminalizing marijuana for personal use. But the throughline, the deeper story, is one that’s set Democratic objectives back, at least in the short term. 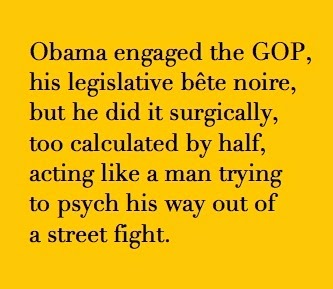 And yes, President Obama engaged the GOP that was his legislative bête noire, but he did it diffidently, surgically, too calculated by half, acting like a man trying to psych his way out of a street fight. But Democrats lost finally not because of any deficit of messaging, or any shortage of concern from President Obama and the White House over turnout or voter disenfranchisement, or the economic issues more regularly keeping Americans awake at night. Republicans won in no small part because of the structural changes to the electoral map, their own tireless efforts at gerrymandering, and, simply enough, because many of the key Senate races this year were in red and/or purple states where longstanding political culture and history reflected the Republican identity, and where Democratic candidates’ reluctance to embrace their own leader favored the Republican message. 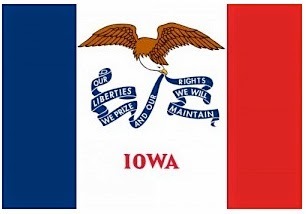 Consider Iowa. Republican Joni Ernst won there in a squeaker over Democrat Bruce Braley in a race that shouldn’t have been that close. In a state like Iowa, it’s frankly a wonder that Braley was even remotely competitive. Much of the Democratic Party’s success in recent years has come through not only expanding the electoral map, but also expanding its outreach to a demographically evolving electorate. Braley, whose party represents that expanding electorate, was up against a huge challenge in a state like Iowa, whose population is overwhelmingly whiter, older and — thanks to a long and grand tradition of farming and agriculture — necessarily more rural than most Democratic voters. Iowa is a stronghold of people more like Joni Ernst, culturally and politically speaking, than people like Bruce Braley. And it has been for years. He issued orders that protected certain undocumented immigrants—but deportations increased, and he delayed further action that would protect undocumented immigrants. He went along with GOP-pushed budget cuts to protect other spending priorities and to prevent a debt ceiling implosion. Through much of this, he had trouble presenting his side of the tale — and he was often reluctant to bash the Republicans because he believed he was obliged to keep trying to forge reasonable deals with the opposition. At times, the president did let loose on his Republican enemies, but this was done only intermittently, in specific circumstances, and Obama never developed a consistent plot line that depicted the GOP as a force of unwavering obstructionism. The message that carried him to victory in the state’s primary was strong enough to use again in the general election yesterday, to great effect. 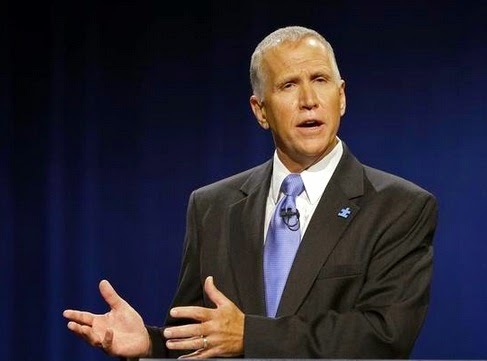 Tillis defeated Democratic Sen. Kay Hagan, 49 percent to 47 percent, flipping North Carolina’s Senate leadership to blue to red and winning the most expensive Senate campaign in American history. Tillis’ message and his strategy have been nothing if not consistent. In May he smashed his weak primary-season challengers, Libertarian/Tea Party darling Greg Brannon (27 percent) and Charlotte pastor Mark Harris (17 percent). And he remained on message long enough, months later, to beat the incumbent Hagan handily. Hagan, who until the very end adopted the Democratic practice of staying at arm’s length from the president, suffered from associations with Obama just the same. But she was somewhat wounded by a Senate career that didn’t set the world on fire for some Tar Heel State voters. One recent poll suggests Tillis has his work cut out for him in the likeability department, despite what happened last night. An NBC News/Marist poll conducted Oct. 19-23 showed Hagan's disapproval rating at 48 percent and Tillis' unfavorables at 44 percent. 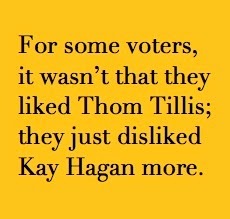 For some voters, it was a matter of not so much liking Tillis as it was a case of just disliking Hagan more. Still, Tillis managed to capitalize on the viral discontent with Washington in general and the Obama administration in particular. Tapping into that broad sentiment didn’t make a big difference last night. Just big enough to win. We’ll see if the sweeping bipartisan overture he made in May holds up when he gets to Capitol Hill next year. Image credits: Tillis: via Real Clear Politics. WHAT was already predicted to be a bad night for Democrats started, well, predictably. 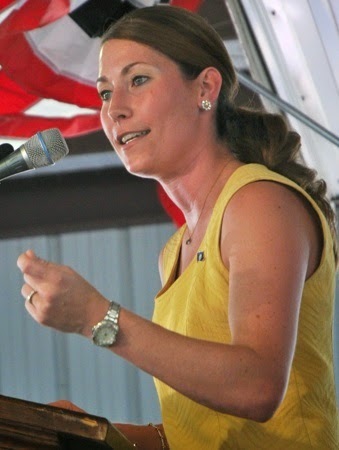 By the night’s end, though, the disaster of Alison Lundergan Grimes’s Senate campaign was a template for the serial Democratic disasters to follow. Built into her losing effort — she fell to Sen. Mitch McConnell, the presumptive next Senate Majority Leader, by fat double digits, 56 percent to 40 percent — was the folly of other Democrats in this election: an unwillingness to stand with President Obama, the standard-bearer of the Democratic Party, and an inability to craft a clear, articulate, passionate message that stay-at-home voters could get their hearts around. 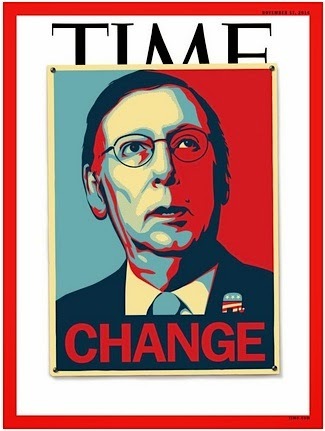 From practically the minute the polls closed last night, McConnell was declared the winner in a hard-fought, nasty campaign. She followed the news of McConnell’s victory with a sour grace note: a concession speech that didn’t concede anything. Grimes, the Kentucky secretary of state, launched a campaign that showed her to be a challenger eager to position herself and her campaign as a fresh alternative to the sclerotic leadership of McConnell, who’s long presented himself as a master of congressional gridlock. Her campaign was seen as a long-shot to begin with; Kentucky is a reliably red state and has been for decades. But Grimes soldiered on for months, holding her own in the polling, focusing on several tractionable economic issues, and bolstering faint Democratic hopes of turning Kentucky blue at the congressional level. Then Grimes committed the unforced error of a political novice. In an interview with the Louisville Courier-Journal, she stubbornly and repeatedly refused to say whether or not she voted for President Obama in either 2008 or 2012. Grimes rationalized — doubling down on her refusal as some kind of a stand of principle, saying that her past voting history had no bearing on what was facing Kentucky in the future. It was the wrong principle to stand on. At least seven times in a week, Grimes refused to answer a question that should have been laughably easy. IT was the kind of inexplicable rookie mistake that might have been overlooked in a primary campaign, but not in this high-visibility general-election contest, with the Senate hanging in the balance. And there’s good reason to think that Democrats, especially black Democrats, didn’t forgive her. A Bluegrass Poll conducted before Grimes’ Courier-Journal interview found HGrimes had a solid core of 80 percent support among the state’s black voters, 8 percent of the state’s total. A Bluegrass Poll after the interview found that black voter support had plummeted 20 points. McConnell’s favorables climbed by seven points. He never looked back after that. The message from Grimes’ curious stand on the sanctity of the secret personal ballot was the wrong one to send. For loyal black Democrats, it sent the corrosive message that Grimes had no conviction — or at least no conviction she was willing to share out loud. And for stay-at-home Democratic voters, the Cousin Pookies of the Bluegrass State, it was just one more reason not to vote. Think of it: the Democratic candidate running for a Senate seat didn’t think enough of the leader of her own party to admit she voted for him. 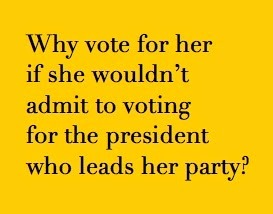 Why vote for her if she wouldn’t admit to voting for him? Image credits: Grimes top: Alton Strupp/Louisville Courier-Journal. Grimes lower: Patrick Delehanty. 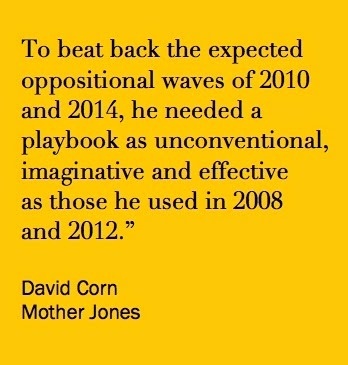 Election 2014: What anti-incumbent wave? The election was characterized before the fact as likely evidence of an anti-incumbent wave, but to this point, that idea hasn't taken hold so far. Whether voters dump incumbents or keep them is a situationally specific matter, rather than something reflecting a broad "wave" sentiment. Incumbents in several key races have been called the winners tonight in Maine, Illinois, Tennessee, Massachusetts, Delaware, Alabama, Rhode Island and New Jersey. More to come. This one may be over already. 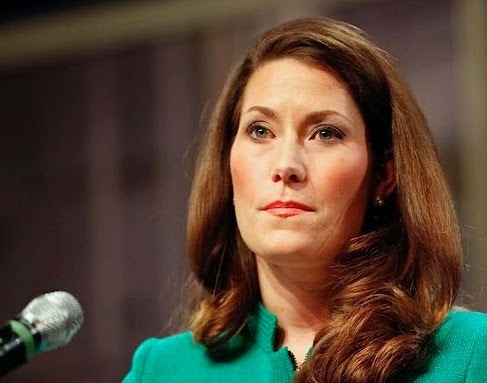 With 1 percent of the vote in in Kentucky’s Senate race, MSNBC reports that Senate Minority Leader Mitch McConnell is swamping Democratic challenger Alison Lundergan Grimes, 60 percent to 38 percent. That’s with only about 12,000 votes cast. It’s early yet but if these early numbers hold up, it’ll be a long short night for Grimes. YES, IT’S TODAY. The time for talk really is over now. It’s Election Day. The cliché machine is warming up in the punditburo’s bullpen. Watch for the phrase “stakes couldn’t be higher.” It’s a reliable phrase, one that’s been used before with varying degrees of accuracy. 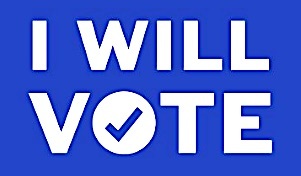 Today, though, what hangs in the balance for the next two years justifies the word “stakes.” The tidal gravity of Congress is set to shift again; it all depends on turnout. It all depends on who shows up. In a recent speech, President Obama called out to Democrats to show up today, conjuring a hypothetical “Cousin Pookie,” the archetypal stay-at-home voter tuned to the rhythms of an African-American audience. It was time, he said, to get Cousin Pookie off the couch and into the voting booth. 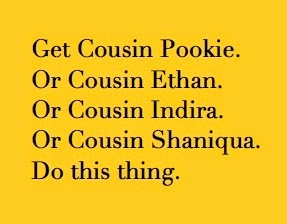 It’s axiomatic in American politics that, for midterm elections, the electorate reliably becomes a nation of Cousin Pookies of both genders and every ethnic slice. Turnout is consistently down compared to elections in presidential-vote years. And this year, more than previously, there’s a lot that’s up in the air. This vote could decide the arc of environmental regulations, the role and projection of America’s armed military might around the world, and the makeup of the Supreme Court for the next generation. It matters. Maybe the stakes really couldn’t be higher this time. So, if you haven’t voted yet, go. If you mail your vote in, dig out the stamps under the bills on your desk. With control of the Senate hanging in the balance, and about 150 ballot initiatives up for decision across the United States, this election will set the stage, thematically and emotionally, for what’s coming in 2016. If you really want to understand how the big show works, you need to be at the dress rehearsal. This is it. This is one of those times. Don’t let it get away.